Guernsey player-coach Andy Whalley hailed his players after they won the EH National Trophy on penalty flicks. Guernsey led 3-1 at half time but were pegged back in the second half by a spirited Banbury side in the final. But the Sarnians were perfect from the penalty spot, while Banbury missed twice to win the shootout 4-2 after two successive defeats in the final. "It's crowned off what's been a tremendous season for us," Whalley told BBC Radio Guernsey. 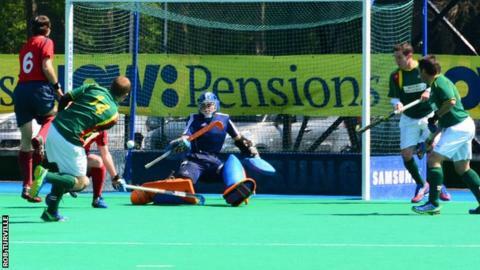 Guernsey won the Inter Island Hockey Tournament in the Isle of Man last September and beat rivals Jersey 7-1 in the annual inter-insular, on top of their EH Trophy success. But having Whalley said his side were apprehensive in the second half. "There was a little bit of nervousness on our part, being our third final and having not won the last two," he added. "But we practiced our penalty strokes and had five guys who were very confident and we dispatched them very well." It is the second time that Guernsey have won the national trophy, having beaten Henley to win the title in 2009.